1. 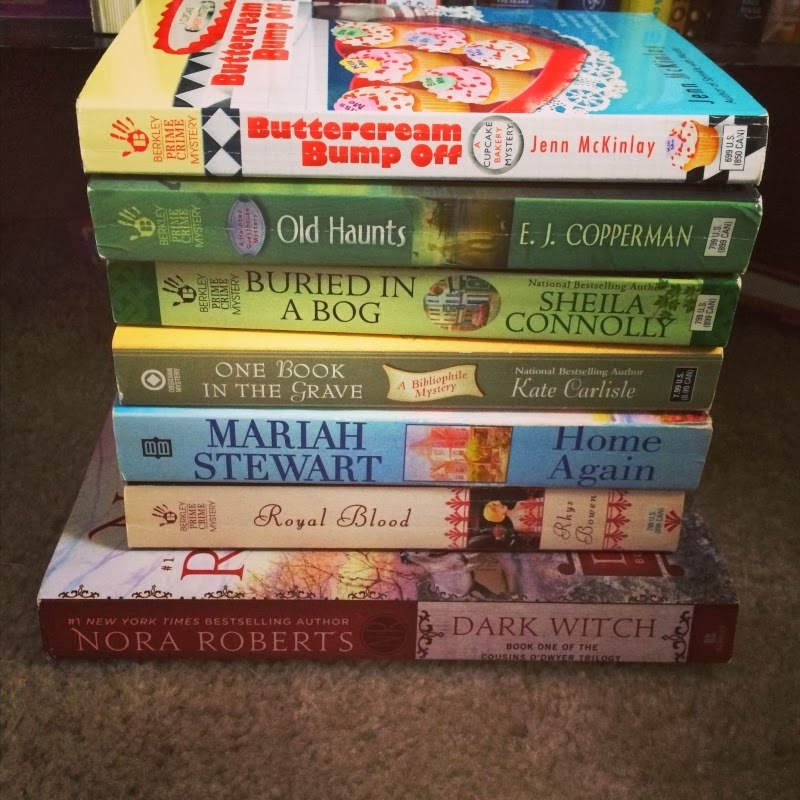 Dark Witch by Nora Roberts (Review) - I was so looking forward to this. Nora Robert's Irish books are some of my favorites. The Gallagher series and Three Fates are absolutely wonderful. This one not so much. It did count as a book for my Irish challenge thoug. 2. Royal Blood by Rhys Bowen - this is the 4th book in a really fun series that is set in England in the 1920s/30s. I have #5, #6 and #7 sitting on my shelf. 3. Home Again by Mariah Stewart - I read the 1st in the series last year and really enjoyed it. Then I read #7 (Review) last month. I have physical copies of #3 - 5 sitting on my shelf, #6 is on my list at the library and I just got #8 from netgalley. I don't think I want to talk about this series anymore. It's getting embarrassing! 4. One Book in the Grave by Kate Carlisle- this mystery series about a book restorer is one I always put off reading yet always enjoy when I do. This is the 5th in the series. I have the 6th on my shelf and should be getting #7 soon from paperbackswap. 5. Buried in a Bog by Sheila Connolly - This is one of my favorite cozy mystery authors. I was so excited when this book came out that I couldn't wait to get my hands on it. That was last year. Still haven't read it and the 2nd is already out. 6. Old Haunts by E.J. Copperman - I've really liked the first 2 in the series but haven't read any of it in awhile. This is #3 and I have #4 and 5 waiting for me. 7. Buttercream Bump Off by Jenn McKinlay - McKinlay is another one of my favorite cozy mystery authors. I absolutely love her mystery series and I really liked the first one of her cupcake series. However I think I read that 2 years ago and haven't picked up another since despite my love of cupcakes. This is the 2nd and I have 3 - 5 waiting for me as well as the 1st one of a new series by her. I didn't even start on my nonfiction bookshelf and this only a tiny sampling of books I desperately need to read that are currently occupying shelf real estate but this is what I'm going to start with for now! Anyone else accumulate serious series backlog?